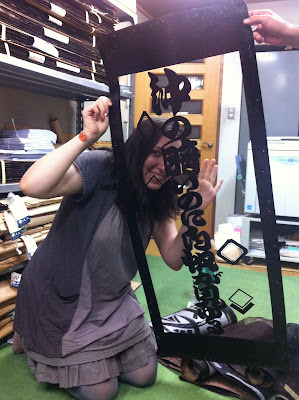 木漏れ日: Misako's store of wonders - Marukyu-shoten (丸久商店) or: Visiting a friend's store at Nihombashi! Misako's store of wonders - Marukyu-shoten (丸久商店) or: Visiting a friend's store at Nihombashi! 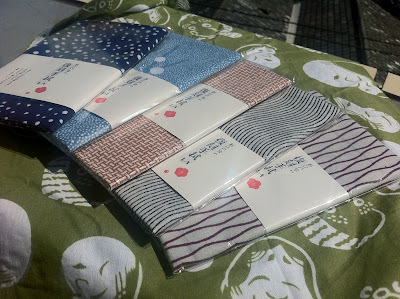 On a hot, very hot summer day I visited Misako's familiy's store! Misako is one very kind and refined Japanese girl whom I've known for a while now and she keeps surprising me with her great personality! Her family owns a store at Nihombashi since 1899, where they sell yukatas, kimono accessories, tabi socks, purses, etc. Being relatively new to this (I wore yukata only once in my life) I went there not really sure what to expect. I was surprised when they took me and one more friend to the floor above the store, where they showed us an impressive collection of patterns(stencils) for dying kimonos and yukatas. They had tens of thousands of patterns wrapped up carefully on the shelves waiting to be used some day. 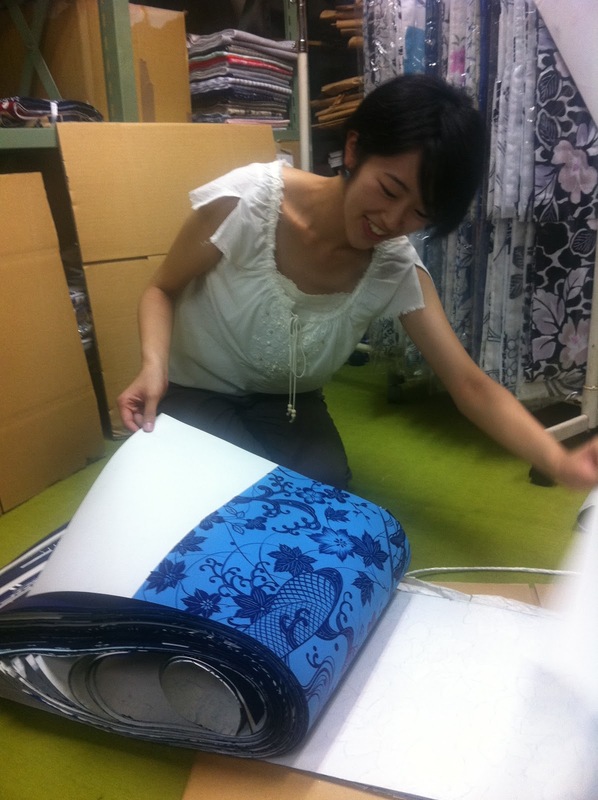 On the photo is Misako holding a gracious dragonfly pattern! 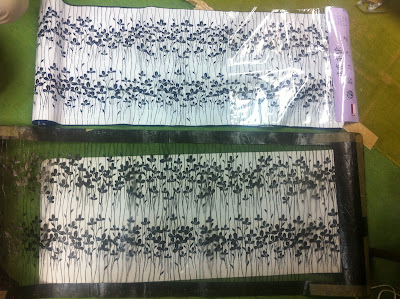 This pattern shows Japanese chrysanthemum - kiku, in many varieties and forms. As they explained and as I hopefully understood correctly, these patterns are rare because of their excellency in minute drawing, fine cutting and difficult dying! 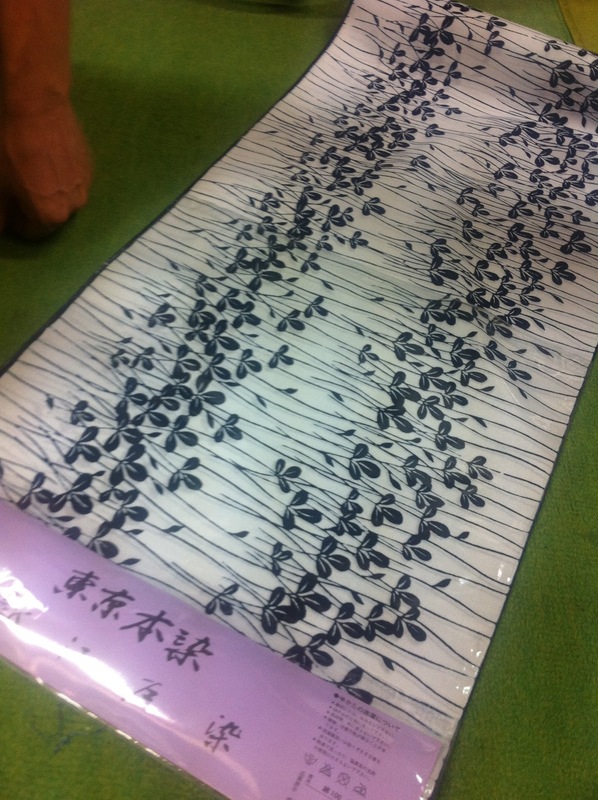 This is a special technique of dying called chusen (注染) and it is used mainly for dying tenugui. Nowadays we can see big patterns and most of it is actually printed not dyed. So dying yukatas and kimonos must be very expensive. 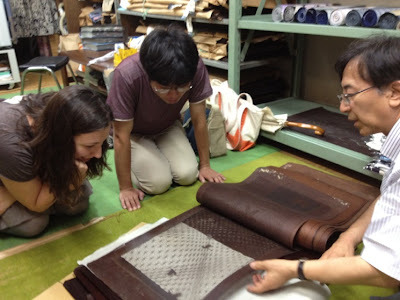 Sending it to the craftsman to only cut the already designed pattern is around　14000 yen. Misako and her father showing us the beautiful patterns! 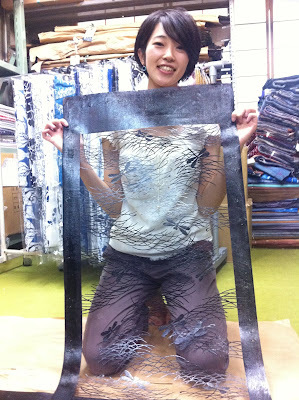 Here is Misako showing us the designs or big sketches as they call it. 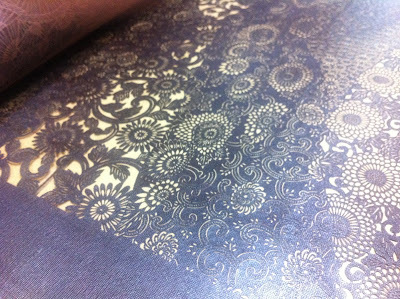 Materials used to make the stencils are silk, urushi and washi (Japanese paper) coated with kakishibu (柿渋). 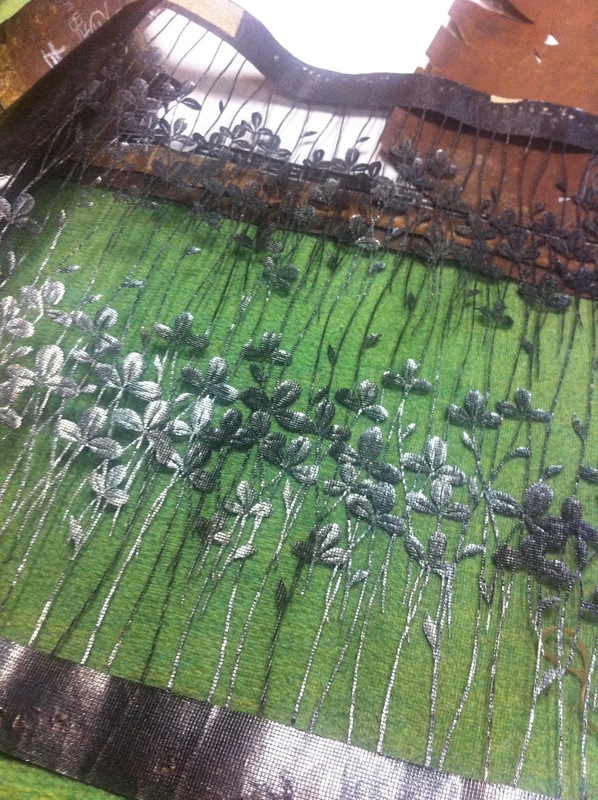 Dying technique resembles silk screen printing, because they apply special glue through stencil which later keeps the colour off from the applied area. One of the patterns which I quite liked. Here is how a dyed material looks like. Admiring the skills of the people who made the patterns, for in their time there were no computers to help them with designing complicated shapes. Me being a silly foreigner. 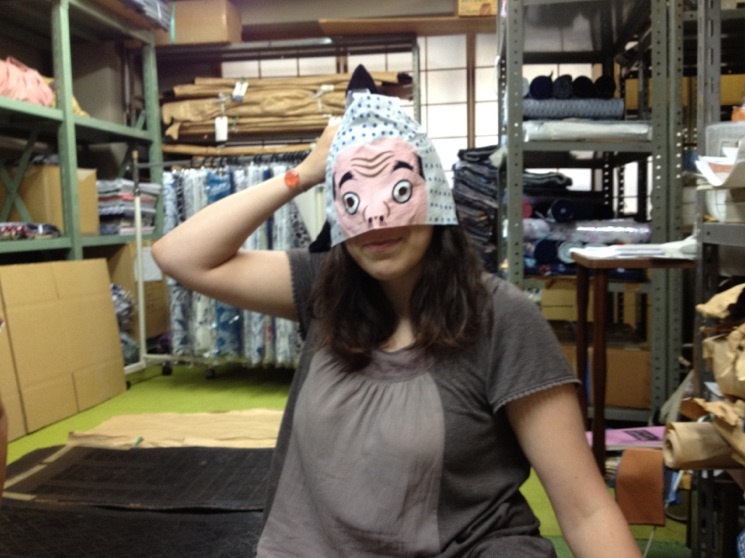 What I have on my face is tenugui, a Japanese towel, with two holes for eyes! In the end Misako's lovely parents gave us gifts to bring back home! I wanted to cry from the shear happiness because the gift was tenugui, and not one - but the whole lot of them! 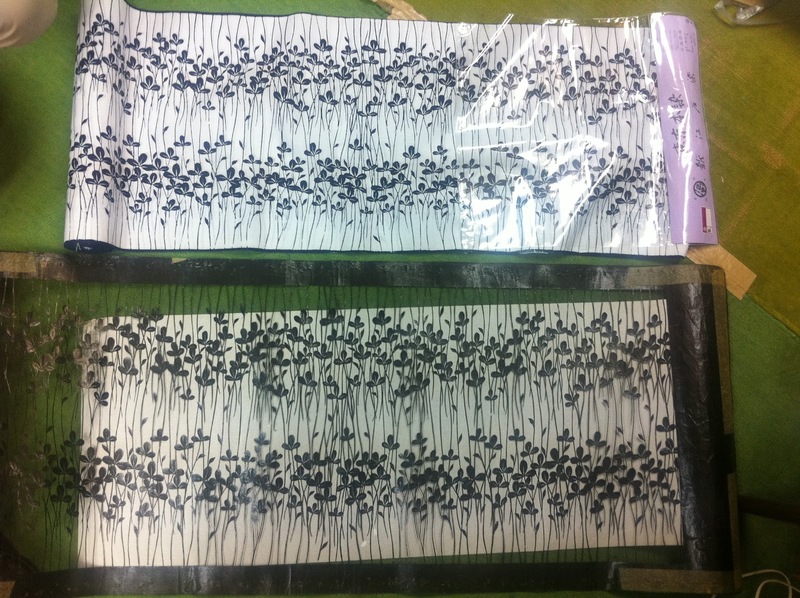 Blue one on the left is a "mountain road covered in snow", second one is also a snow themed one, third shows the minute pattern called "kagome" - a woven-bamboo pattern. Not exactly sure about the two on the right but they are beautiful in their minuteness and simplicity of the design. These ones are with mistake, but I will keep them preciously nevertheless! 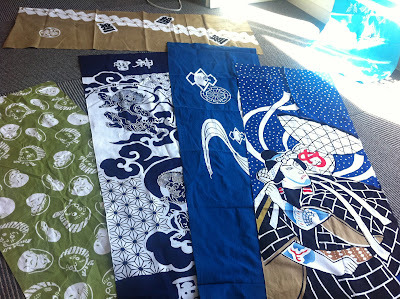 One more time I was amazed by the richness of the Japanese culture! They are a very diligent people with refined taste in art and beauty and when you combine the two you get truly amazing results! Thanks to Misako and her wonderful family!